This site is designated to all those who are willing to venture into the unknown. Open your mind and turn off your phone. Have you ever asked yourself, who am I? What am I? Where am I? If you have, then this site is for you. This site is about, what you think, say and do. It will make you sad, laugh and cry. It will make you want to live rather then die. In this site appears your Mind, Body and Soul. In this site is the process of creating your goal. Do you want to become aware of your ability to create? To become aware of your destiny and fate? This site is for you. Can you tell a lie from what is true? This site will not only tell you how, but who. 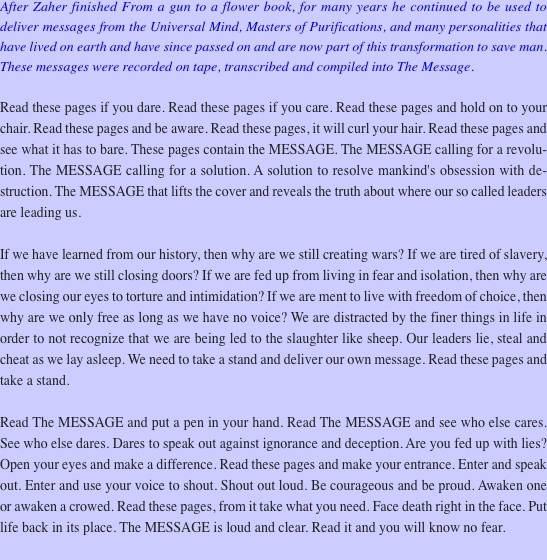 In this site is your responsibility to life. To your children and your wife. In this site is the power to recognize your intelligence. This site is the creator of awareness. Do you want to know the difference between your mind and your brain? Then let this site take you to that ordain. This site will contain a revelation. 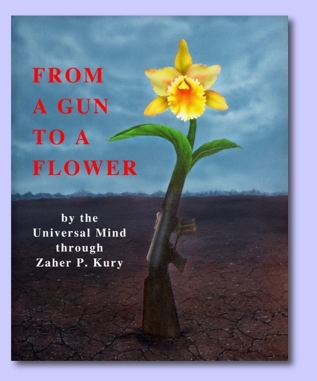 From A Gun To A Flower is the declaration. From war to peace is the destination. If you want to change from bad to good. From sickness to health. From powerlessness to being powerful. This site is for you. This site contains a new reality that will pull you through. Are you tired of feeling weak and used up? Then don’t stop. Are you in need of courage and strength? Are you confused and on the brink? On the brink of giving up on life? Have you had enough? This site is for you. Do you feel lonely and blue, lost and have nothing to do. Take our hand and enter through. This site will get you connected. You will feel recognized and accepted. This site contains what you need to overcome being rejected. Do you live in the dark and have many fears? Do you drive through life without any gears? Unable to climb the mountains that contain you? Do you eat many truths but are unable to chew? This site is for you. This site contains words that will cause you to care. That will pull you out of your chair. Words that will awaken you from your dream. Will make shout out loud and scream. This site contains words of love and human relation. Words that will bring you out of your deliberation and empower you to make a choice. To take a stand and have a voice. This site speaks of creation and a universal vibration. It speaks of clarity and a solution. A way out of poverty and hunger. A way out of going under. This site speaks about a nation that can overcome annihilation. Do you want to be apart of the problem or the solution. Part of ignorance or education. Part of salvation or retribution? This site has a voice. It is loud and can be heard as you read. In your heart it will plant a seed. Learn how to overcome greed. Enter and be freed.